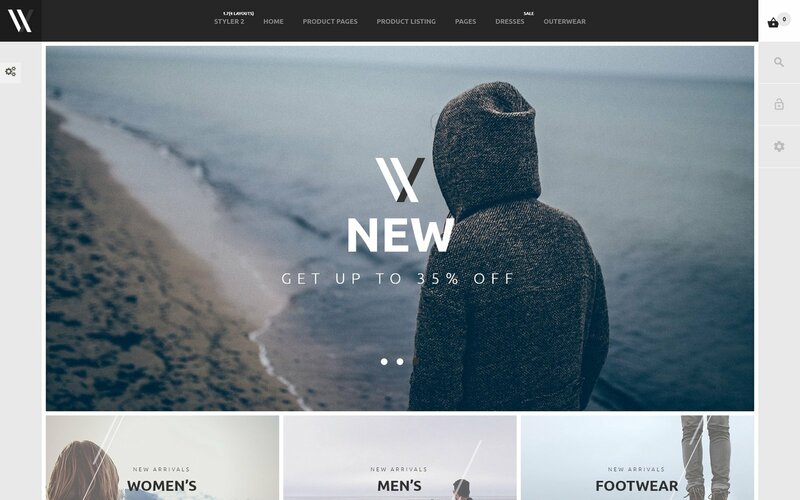 Styler is a highly customizable and elegant PrestaShop template that can be used for a wide variety of online stores and platforms, including fashion shops, clothing, footwear, furniture stores, and more. Make Styler truly yours and change its design beyond recognition with a set of ready-made color choices and typography presets. Your fashion store would look beautiful on any kinds of devices, including mobile phones, tablets and desktops thanks to a full design responsivity. Take advantage of Ajax search form to allow your visitors view the search results come up even before they hit enter. 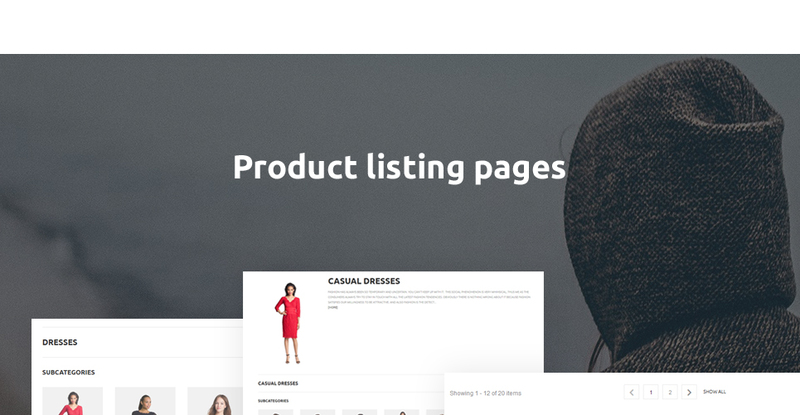 Sort your products based on categories and let your customers find what they're looking for more effectively with product sorting and Ajax filtering options. Make use of a mega footer and mega menu so that all of your assortment can always be found in one place. Attach badges to products to promote sales and discounts. 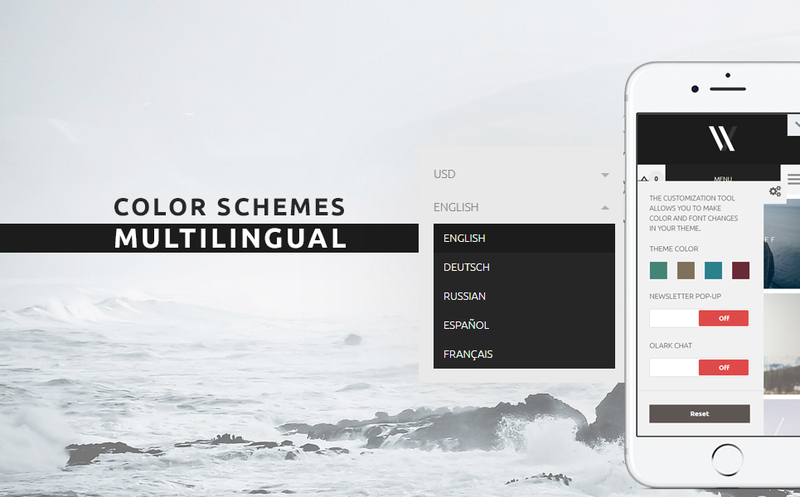 Styler also comes with such features as lazy load effects, stick-to-top menu, parallax scrolling, tabs, newsletter subscription pop-up and many more. Give Styler a try, and create the online store you've always wanted to.This template is listed in The Best Premium PrestaShop Themes 2016 chart. On-line chat is a function that involves live texting over the web. Online chat contact increases users positive experience and makes them feel really very important while providing additional support. Sample data installer WordPress themes have a possibility to add sample files to the template without difficulty. Sample Data Installer will let you instantly install a web theme along with the data files and have a ready-made web property such as you viewed it on a live demo. Search engine friendly digital products are enhanced as per the present day SEO standards. This grows the opportunities they'll be detected online, hence growing your online site's search engine ranking positions in serp's. While customers trust search engines, therefore internet websites that appear to be in the top of search result will increase the number of clients and provide large income. Responsive design is a method of website design that lets pages to adjust to a display resolution of any type of device - be it a personal computer, a tablet or a smartphone. Responsive design may let your business site appear equally well on display of any type of laptop or portable device. Bootstrap is an open-source framework for crafting web sites. What is Extended License for Fashion PrestaShop design? Is it reasonable to make unique purchase of Fashion & Beauty News PrestaShop template that was already purchased before? Yes, it's reasonable to make a unique purchase of Fashion & Beauty News PrestaShop template. Because there is very small chance that you will find the same design on the net. There are more than 3,000,000,000 webpages online now according to statistics on www.google.com. How can I modify PrestaShop template for Clothes Resale to suit my particular website? Please visit our Online Help Center to obtain detailed instructions on editing PrestaShop template for Clothes Resale. What will I see instead of the images after installation of the PrestaShop ecommerce template for Fashion Blog? After PrestaShop ecommerce template for Fashion Blog installation you will see blurred images included for demo purposes only. Are there any discounts if I'm buying over 10, 20, 30 or more Beauty PrestaShop template? Please email to marketing@templatemonster.com with your inquiries about Fashion PrestaShop ecommerce themes. Can I put a line at the bottom (or any other spot) of my new product "Website development by Company name" after purchasing PrestaShop ecommerce template for Fashion & Beauty News ? Yes, you can place a note at the bottom (or any other spot) of my product "Website development by Company name". Nevertheless, you cannot place "Website design by Company name" while using one of PrestaShop ecommerce template for Fashion & Beauty News . Are your PrestaShop ecommerce templates for Apparel Storecompatible with any CMS? Will TemplateMonster help me to install my PrestaShop theme for Online Fashion? Some of our products like osCommerce templates, Zen Cart templates, etc. require installation to operate. Installation services are not included in the package price. TemplateMonster though offers you a variety of sources to help you with installation of your PrestaShop theme for Online Fashion including installation instructions, some articles with our Online Help Center. Our Knowledgebase contains customers questions and most frequent problems. Anyway, you can always refer to our partners from TemplateTuning.com to install your PrestaShop theme for Online Fashion for you for a small fee. Can I apply a discount code to a discounted Fashion Designer PrestaShop theme or combine several discount codes together to get better price? Can I resell the customized PrestaShop ecommerce template for Clothes Sale? No, you cannot resell the customized PrestaShop ecommerce template for Clothes Sale as a template but you may sell it as a project to your client (see paragraph 1 ONE TIME USAGE LICENSE for more details). Can I contact the PrestaShop ecommerce theme for Clothes Rental author? Yes. You can contact this PrestaShop ecommerce theme for Clothes Rental author/author's team directly using your personal account under the Support tab. Can I resell the PrestaShop templates for Online Clothing Boutique I bought the extended license for? No, you cannot resell the PrestaShop templates for Online Clothing Boutique as is. You can only sell them as the integral part of your new product. Will the Fashion PrestaShop design theme be deleted from TemplateMonster database? No, the Fashion PrestaShop design theme will not be deleted from TemplateMonster database. Is there any return policy for PrestaShop ecommerce templates for Fashion Blog? Requests for a refund are accepted at www.template-help.com/tickets within the period of 2 weeks after the order of PrestaShop design for Streetwear Fashion is placed. You should accompany this request with detailed and grounded reasons why you apply for a refund. Please make sure your request does not contradict the terms and conditions specified in the policy. A refund is issued to you upon receipt of a Waiver of Copyright signed by you. Can I get the extended license for some other pricing than the half of the initial PrestaShop design theme for Fashion & Beauty Magazine price? No. The price for purchasing license for a single PrestaShop design theme for Fashion & Beauty Magazine is the half of the template unique price. What do I receive when I order a Fashion & Beauty Blog PrestaShop ecommerce theme from TemplateMonster.com? After you complete the payment via our secure form you will receive the instructions for downloading the Fashion & Beauty Blog PrestaShop ecommerce theme. The source files in the download package can vary based on the type of the product you have purchased.If you need unzipping software to open the .zip archive, Windows users may visit www.WinZip.com, Mac users may visit www.StuffIt.com. Do you provide any scripts with your Fashion PrestaShop themes or could you do some custom programming? Our templates do not include any additional scripts. Newsletter subscriptions, search fields, forums, image galleries (in HTML versions of Flash products) are inactive. Basic scripts can be easily added to a PrestaShop template for Fashion Show at www.TemplateTuning.com If you are not sure that the element you're interested in is active please contact our Support Chat for clarification. Is it possible that Template Monster will contact my client which website I made from Template Monster's website PrestaShop design for Streetwear Fashion? Yes, our legal department checks licenses regularly. In case we won't find designer's contact information on the site which was made from the PrestaShop design for Streetwear Fashion of ours we will contact the owner of the site directly. Will TemplateMonster help me to edit my PrestaShop template for Fashion Shop? 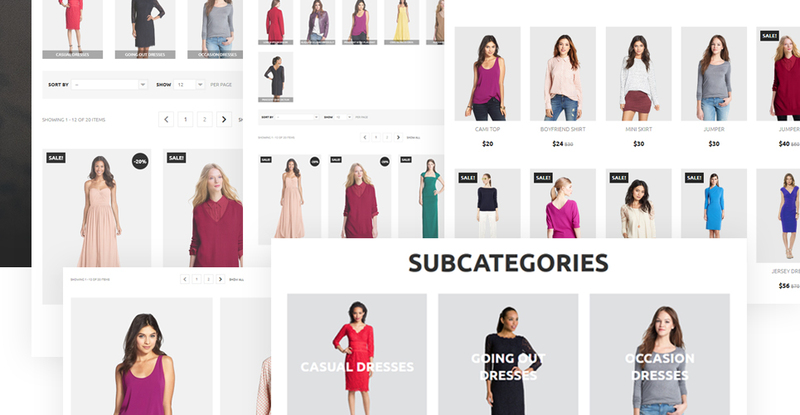 TemplateMonster offers you a variety of sources to help you with your PrestaShop template for Fashion Shop. Use our comprehensive Online Help Center to get the basic knowledge about your PrestaShop template for Fashion Shop. Our Knowledgebase contains customers questions and most frequent problems. Anyway, you can always use TemplateMonster 24/7 phone support, try our Ticket System or Live Support Chat to get qualified assistance from our support representatives. Are there any limitations on selling the PrestaShop ecommerce template for Fashion Articles as the integral part of my new product? I would like to make payment for PrestaShop template for Fashion Shop by company check. Is that possible? Please use Skrill payment option. They accept payments by check.You can place an order for PrestaShop template for Fashion Shop on the site under the name of the company and choose Skrill merchant system for making payment from the company's account. To initiate bank transfer, please create an account here - www.skrill.com, add the number of your bank account and verify it. After that, you can place an order on our website and choose Skrill on checkout page. When the payment is made, the product will be sent to your e-mail along with the invoice under the name of your company. 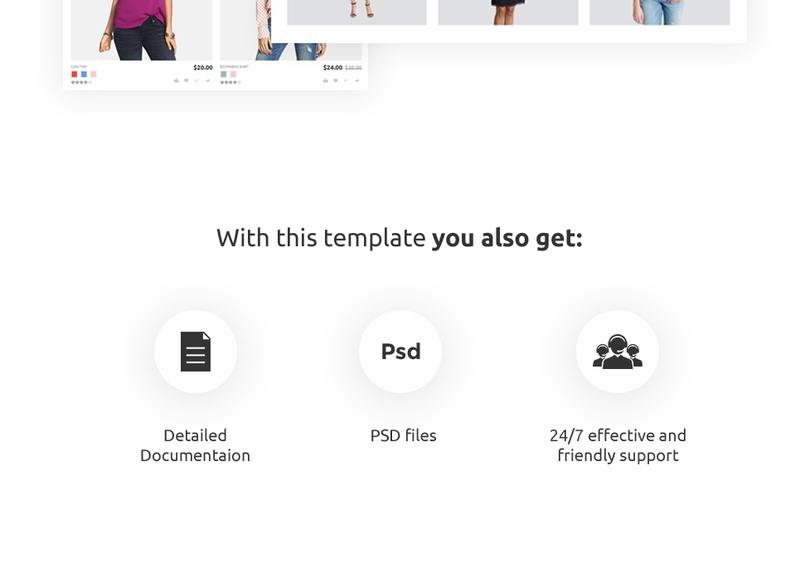 Can I get the PrestaShop design for Womens Fashion in higher resolution to use for printing? No, we design PrestaShop templates for Clothing Sales optimized for web resolution only. Can I integrate the PrestaShop design for Vintage Fashion with third-party software or applications for development of my new products? No, you cannot get the developers license for development of PrestaShop design for Vintage Fashion or other products. Encore besoin de travailler sur le template et se familiariser, mais il est top et apporte un cot&eacute; pro et &eacute;pur&eacute;. Je suis fane. apr&eacute;s avoir acheter ce templates et essayer de l&#039;installer, j&#039;ai rencontr&eacute; quelques difficult&eacute;es mais le service client a tres bien pris en charge mes demandes et m&#039;a fourni l&#039;aide dont j&#039;avais besoin pour reussir l&#039;installation de ce templates pour ma boutique en ligne. This is honestly the best theme I&#039;ve ever seen for PrestaShop. Beautiful in its functionality and tonnes of features and customizations. I was running a active store already and the theme installed over the top without a single issue and my store was up and running within 30 minutes with the new theme configured. See how it looks with a completely different product-range to the example: https://GlindaWand.com.au I did had a slight issue with the Mega Menu enumerating my CMS articles, but the support was brilliant. Daniel got back to me immediately and assisted with getting it working perfectly. Love it and would recommend this theme for any site. This item was bought for a client who was very satisfied with the result. This theme gave completely different look to an online store, it&#039;s more stylish and reflects the latest trends of web design. Really really great! As always there were minor issues here or there but everything can be easily changed and fixed. This time we even haven&#039;t needed to contact customer support. Overall awesome theme! This is a great template for those looking for a website that is mobile, desktop, etc. friendly. Because it is responsive, the page renders based upon what device the user is using. It passes the Google &quot;Mobile Friendly&quot; test very well. Plus, it is really easy to edit and make your own as long as you have a little knowledge of PHP &amp; HTML. It also has a very &quot;fresh&quot; and &quot;clean&quot; feel to it that is easy on the eyes for the client. I&rsquo;m web developer and I found this template well structured. Also my customer likes the design of this template. It is very good to build any fashion store. The modules in home page are in the right position and looks very fine! When I installed the template with its demo database was exactly like in demo page. It&rsquo;s very important to show to my customers a working demo. Thanks one more time TemplateMonster, I save a lot of time from design and my incomings are doubled! How i can delete VX or W in homepage on top??? Hello, can I have more than 3 categories displayed below the baner photo? - Added the quick view page. We fixed minor Styler bugs. - redesigned the Sitemap page. - TM Mega Menu module.